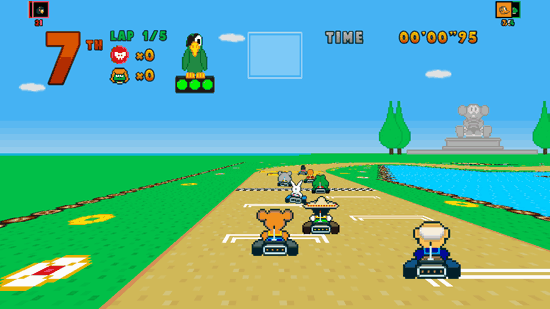 Everyone loves playing racing games, and Poppy Kart is a free racing game for Windows 8, developed by Webrox. It is available to be played on the Windows 8 and 8.1 computer. This racing game is different from other racing games and is really impressive and compelling. When the game starts, it asks you whether you want the game to be pinned on the home screen, you can click on yes or no according to what you want the game to do. You can log in with your Facebook in Poppy Kart to enable it to access the score and other things on your Facebook profile or timeline. To play the game, click on Play button in the middle of the game screen. The game shows you what you will need to play the game, like a remote control or a keyboard. Poppy Kart has two levels: Progressive and Expert. You can choose the one you want to play. 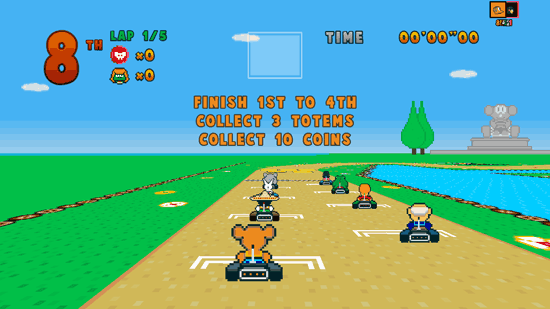 Initially you cannot choose the player you want to play as the main character for the racing but there are many players that can be unlocked in future. After choosing the player, you will be taken through the story that the game is based on. In the game you will have to collect Totems to reach the different levels and to get closer on finding the Froggy, the character that has left for the party and left the leave note to the father. The game is a real fun when you play it. There are different hurdles in the game, you have to collects different collectibles to move on to the other level. You can change various settings for the game by clicking on the Settings tab from the homepage. The settings include language, controls including common, keyboard and Xbox; audio settings like changing music or FX volume or switching it on or off and video settings like FPS display toggled on or off.